Women make up only an estimated two percent of the global maritime industry. In the U.S., the statistics are a little better, with less than eight percent of ship and boat captain operator roles held by women. Still, for a female to have the opportunity to train up to ship captain is considered “unique.” However, as predictions are being made that there will be a shortage of more than 140,000 deck or ship officers worldwide by 2025 (BIMCO/ICS), we will see more accomplished women take the helm and lead the industry forward. In fact, that’s already happening. This past June, the Cape May-Lewes Ferry, made history by promoting three women: Meghan D. Palmer of North Cape May, and Melissa Velli and Sharon Lyn Urban, both residents of Cape May, to rank of Captain in the Marine Department. These three female Captains are doing more for the industry than just oversee the safe navigation and operation of the vessel; they serve as a symbol that the role of piloting a ship is a female-friendly role with ample opportunity for those looking for a long-term, stable and rewarding career path. As Captains, Palmer, Velli, and Urban have earned all the requirements and qualifications to lead the entire vessel and crew, with each possessing a United States Coast Guard (USCG) Inland Masters License of unlimited tonnage and USCG First Class Pilot upon the Delaware Bay License of unlimited tonnage. Both Urban and Velli joined the Cape May–Lewes Ferry marine department as Ordinary Seamen in 1997 and 2003, respectively. They rose through the ranks – up the hawsepipe – serving as Able-bodied Seaman and Mate prior to their recent promotions. A graduate of the U.S. Merchant Marine Academy, Ms. Palmer was hired at the Ferry in November 2011 as a seasonal Able-Bodied Seaman. In addition to a Bachelor of Science degree in Logistics and Intermodal Transportation, Ms. Palmer also earned an Ocean’s Unlimited Tonnage Third Mate’s License during her time at the Academy. Palmer, Velli, and Urban are able to “sail up” as Captain when needed, supporting the three full-time Captains who service the Cape May-Lewes Ferry fleet which includes the M/V Cape Henlopen, M/V New Jersey and M/V Delaware. They are responsible for supervising the loading and discharging of vehicles and patrons on the car deck, serving as the on-scene leader during onboard drills and emergencies, completing the required records and logs during a shift, as well as assisting the Captain with overall vessel management. Each vessel can carry approximately 800 passengers and 100 vehicles on any one journey, with a crew consisting of ten marine personnel ranging from captain and chief engineer to ordinary seaman. Recently, more women are being spotlighted in this role. On April 19, 2018, Ferry history was made with the first all-female bridge crew navigating across the Delaware Bay with Captain Sharon Urban and with Melissa Velli serving as Pilot, and Helmsman Paulette Nickels. Beyond the Delaware Bay, Fire Island Ferries in New York has crews composed entirely of female captains and deckhands, with women making up about a third of its summer staff of 200. All-female crews can be found on the Davis Park Ferry, from Patchogue to Fire Island, Sayville Ferry and North Ferry, from Greenport to Shelter Island. And the NYC Ferry has women making up 40 percent of the maritime workforce. For those who are willing to learn, or may have pulled themselves out of traditional career tracks, the opportunity for upward mobility is there. The industry is one where you can work your way up regardless of schooling or degrees. For example, Captain Sharon Urban started her career in food service, joined the Ferry crew and worked her way up the ranks. Today women are breaking barriers in the maritime industry—they can have a successful career in seafaring while living a lifestyle that allows them to have a family and be home at night. As the industry experiences a large portion of the workforce approaching retirement, and local hires become more difficult to find, we must welcome this new talent with open arms. 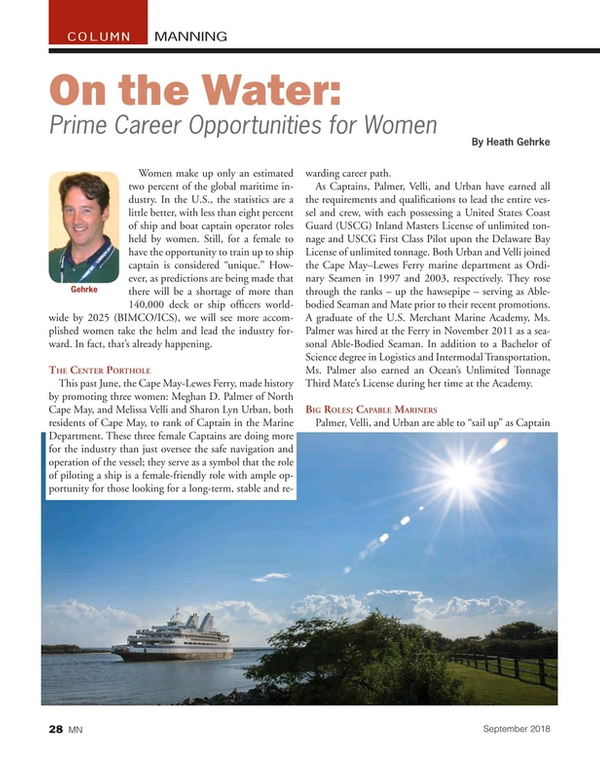 Heath Gehrke is the Director of Operations for the Cape May – Lewes Ferry. He manages a staff of over 350 permanent and seasonal employees. He is a licensed U.S. Coast Guard Master and a Commander in the U.S. Naval Reserve.